IT'S TIME TO GET THAT SWIM STROKE FIXED!! Get your swim stroke filmed and analyzed by a USAT certified open water swim coach! You get a 180 degree view of your stroke! 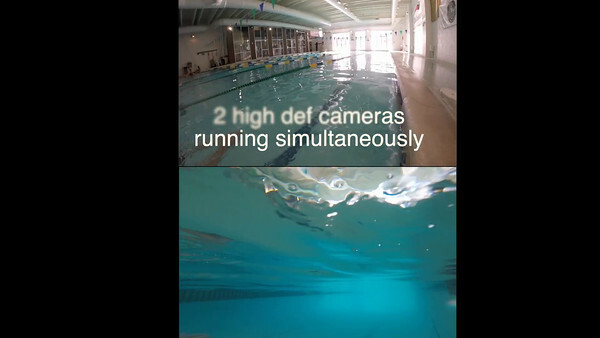 Two cameras film simultaneously, one is above the water and the other below. I process the video so that you can see both angles in the same video so you can easily see what's happening above and below the water at the same time!!! All video is angles will be included in the DVD. I'll have you swim at different paces during the taping including drill pace, race pace and sprinting. Varying the speeds will help you determine how your stroke changes as your pace increases and you fatigue. Video taping angles include side view, front, rear angled front view, angled rear view and directly above. Each session is approximately 30 minutes so there is time for questions and warm up etc. After taping I have to process the raw footage before I can get the video back to you. This process takes2-3 days per video. I generally deliver the DVD within a week of taping. You get all the raw footage along with the side by side views all on an easy to navigate menu driven DVD. I also upload video to YouTube for your convenience. This will get you about 300 yards of filming using 2 cameras (above the water and underwater simultaneously) from a variety of angles. Includes everything you get with the "standard" package plus a follow up video session whenever you want. You save $75 off of the second taping!